Your kitty's pickiness might be the result of a sensitivity to food. Cats are picky, but when your kitty can't seem to keep his food down or it causes diarrhea, he probably has a sensitive tummy. When your cat's food is disagreeing with him, your vet can help you get to the bottom of the problem and find the right solution. Telling the difference between a sensitivity and an allergy is as simple as looking at the symptoms. When your cat has food sensitivities or intolerances, his digestive system will respond to the offending food, while with an allergy it will be his immune system responding. Either condition can cause nausea and diarrhea, but a food allergy will also cause a rash, itching and sometimes breathing problems. Other symptoms to look for with a sensitivity are gas and bloating, vomiting and stomach pain. Sensitivity to food isn't always caused by the same thing. Even though cats enjoy a dish of milk, most of them lack the enzyme to digest lactose. Not being able to process one or more elements in a food will cause vomiting, diarrhea and other signs of food sensitivity. Sometimes cats will have difficulty digesting additives in their food, such as artificial flavors and dyes. Medications can affect your cat's stomach, too, causing sensitivity to his usual food. And other times, just the fact that a new food has been added to his diet will bring on the symptoms of sensitivity. In treating your cat for food sensitivity your vet will first need to test him for allergies. This is done through blood testing and will pinpoint allergies or rule them out. 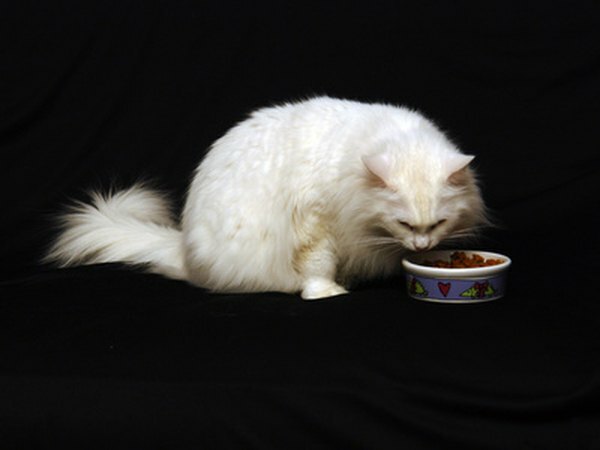 Once your cat's condition has been determined to be food sensitivity, you may be asked to withhold food for a time—usually no longer than 24 hours—and then slowly introduce a bland diet. Once his symptoms have cleared up, one by one you'll be allowed to feed your cat foods from his "old" diet so you can watch for a reaction. This will help you determine what specifically he is sensitive to. There are commercially prepared foods on the market that are made especially for cats with sensitive tummies. Your vet can recommend a brand or you can look into foods that contain alternative proteins, such as venison. Prepared baby food is another option, the lamb or beef formulas being the easiest for cats to digest. Or you could opt to make your cat's food yourself with ingredients like canned tuna or salmon, steamed carrots, broccoli or zucchini and low sodium broth. Make sure to consult your vet first if you decide to try this: cats have very specific nutritional needs and an inadequate diet can cause serious medical problems. When Do You Stop Using Puppy Food & Move to Adult? Does Wet Food Give Cats Diarrhea? 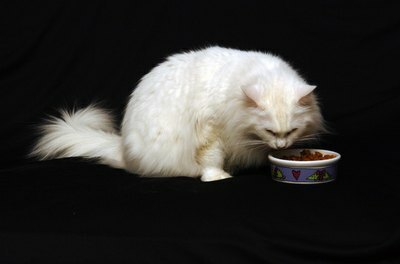 Could Cats Have a Problem With Swallowing Their Food?